Lees Ferry, located on the Colorado River about 7 ½ miles below Glen Canyon Dam, is probably best known as the jumping off place for river rafting the Grand Canyon. Every year hundreds of people make their way to Lee’s Ferry to encounter which, for many, will be the adventure of a lifetime. Here they will come face to face with their fears as they challenge the harsh and unforgiving forces of nature. Here they will experience the adrenaline rush of white water rafting, and here, too, they will enjoy the serenity and incredible beauty found within the steep sandstone walls of this grandest of canyons. But beyond this, Lees Ferry is rich in history. It was here, in 1776, that Franciscan friars, Atanasio Dominguez and Silvestre Velez de Escalante scouted the area for a place to cross the muddy Colorado. 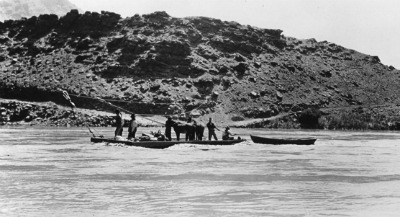 Almost 100 years later, in 1864, Jacob Hamblin, a Mormon pioneer, and his men built a raft at the mouth of the Paria River which flowed into the Colorado, and used it to transport them, their horses and supplies across the Colorado. They called it the Paria Crossing. In 1870, Brigham Young, President of the Church of the Latter Day’s Saints in Salt Lake, sent John D. Lee to build and operate a ferry at the confluence of the Paria and Colorado rivers. This was all part of an expansionist program to spread Mormonism across the western United States. But, more than this, Lee had been excommunicated from the Mormon Church and exiled from Salt Lake for his part in the Mountain Meadows Massacre where 120 eastern pioneers had been murdered. Just as we shall always remember the attack on Pearl Harbor on December 7, 1941 as a day of infamy, the Mountain Meadows Massacre in southwestern Utah on September 11, 1857 shall always be remembered as a shameful blight on the Mormon Church. On this day, under a white flag of truce, John Lee and William Bateman, who were part of the Mormon militia under the command of Major John M. Higbee, approached an emigrant wagon train which had been under siege by the Paiute Indians. They were told that if they would lay down their weapons and file out in single file their lives would be spared. These pioneers from Arkansas, who had been under siege for several days, had no choice but to accept the terms: they were low on food, water and ammunition and had wounded who needed medical attention. They laid down their weapons and filed out in two groups; women and children in one group and the men in the other. Upon that command, the Mormon Militia turned and fired point blank at the unsuspecting emigrants, killing 120 men, women and children. “None who are old enough to talk are to be spared” was the order from above, according to John D. Lee who later wrote about the slaughter. The Church tried to keep the massacre a secret but it was impossible that something this horrendous could forever be kept quiet, and word of the slaughter spread across the country. For years the official word from the Church was that the massacre was the sole action of the Paiute Indians, and it wasn’t until 1870, thirteen years later, that the Church excommunicated John D. Lee and Isaac Haight for their roles in the slaughter. Lee and his families moved to the confluence of the Paria and Colorado Rivers where they built houses for themselves and began construction of a wooden ferry capable of transporting Mormon emigrants, their wagons and their livestock across the Colorado River. On January 11, 1873, they launched the ferry for the first time, and over the next several years, ferried thousands of families across the river. The ferry would always be known as Lees Ferry. However, this was not to be a happy ending for Lee. The Gentile press continued to pressure Brigham Young and the Mormon Church to bring forth the men who had been involved in the Mountain Meadows Massacre. 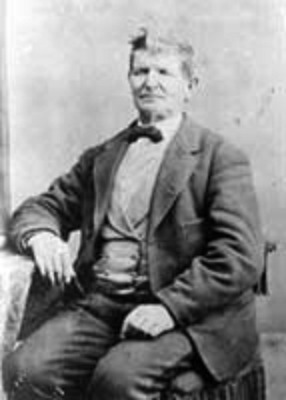 In 1875 John D. Lee was arrested and brought to trial in Beaver, Utah. His jury was composed of eight Mormons and four Gentiles. All eight Mormons found him not guilty, but the four Gentiles found him guilty. The result was a hung jury. On September 14, 1876, Lee was brought to trial for a second time. However, with mounting pressure being applied to Brigham Young and the Church, this time more witnesses were found who were willing to come forward and testify against Lee. They admitted that, although members of the Church had been involved, were it not for the hothead John Lee, the confrontation would never have escalated into a massacre. The verdict, by an all Mormon jury, was guilty and Lee was sentenced to be executed. Fittingly, on March 28, 1877, after all appeals had failed, John Lee was brought to Mountain Meadows and was executed by a five member firing squad. His body was buried in the Panguitch cemetery. "I claim that Brigham Young is the real criminal, and that John D. Lee was an instrument in his hands. That Brigham Young used John Lee, as the assassin uses the dagger to strike down his unsuspecting victim; and as the assassin throws away the dagger, to avoid the bloody blade leading to his detection, so Brigham Young used John Lee to do his horrid work; and when the discovery becomes unavoidable, he hurls Lee from him...and casts him far out into the whirlpool of destruction." Lee’s wife Emma continued to operate Lees Ferry until it was purchased by the Mormon Church in 1879. The Church paid $3,000 for it and sent Warren M. Johnson and his wives to operate the ferry. They operated the ferry and managed the farm until 1896 when James S. Emett took over the operation. In 1909, the Ferry and Lee’s ranch, Lonely Dell, were sold to the Grand Canyon Cattle Company who operated it for one year. In 1910, Coconino County bought the ferry, and brought in the sons of Warren Johnson to run it. The ferry remained in operation under the ownership of Coconino Country until 1929 when Navajo Bridge, located just 5 miles from Lee’s Ferry, was opened to traffic crossing the Colorado River thus eliminating any need for a ferry. 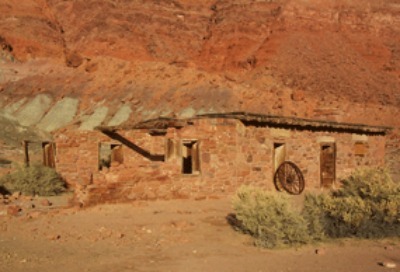 All that remains now of John D. Lee’s efforts over the years is the fort he built as protection against Navajo raids and which was later used as a trading post and school. This building is known as the Lees Ferry Fort. 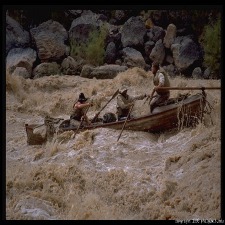 Today, Lees Ferry is a staging area for rafters as they head downstream and for fisherman who wish to fish the quality waters between Lees Ferry and Glen Canyon Dam. It is, also, the place where rafters put in after floating the river below the Glen Canyon Dam. Lees ferry played a major role in the history of the west, but only a minor role in the history of John D. Lee. Perhaps for a time he was able to put the massacre behind him. But, in the end, his past caught up with him when, on March 28, 1877, he returned to Mountain Meadows for the last time.